Brightest Young Things recently sat down with Greg Graffin to have a chat about his book Anarchy Evolution. For an interview it's definitely a break from the norm. Read about his almost-encounter with Salman Rushdie, his favorite non-human species being canis lupus, oatmeals at Starbucks, and of course the two main themes of the book: evolution and punk rock. Check out the entire interview from April 26 before the 9:30 Club show in Washington right here. On an unrelated note: we already knew Greg is going to teach evolution in the fall semester at Cornell University. Apparently this will be the first year of three that he is going to help develop the course and co-teach at Cornell. His lectures will be on Tuesdays and Thursdays, so does this mean there's some room for his side-project Bad Religion? To end this Greg special, he will be back in DC next week on Tuesday 24 for a science policy discussion with Steve Olsen and His Excellency, Monsignor Marcelo Sànchez Sorondo, Chancellor of the Pontifical Academy of Science, and science advisor to Pope Benedict XVI. It's called "Can art and religion serve as methods for governing emerging science and technology?" and is part of a series presented by Arizona State University. Reported by: wooohno, kateuk20, Otto, Watcho! I liked the content of this interview. But it sounds like it was done in another language and then translated (poorly) back to English. Were they really talking like this? I was only 80% sure I was understanding some parts of it. gd interviewI, only found out recently that I share the same birthday as greg G hehe pretty kool. Greg's left thumb is bent. Just like mine :) I've finally found another similarity between me and him. I've finally found another similarity between me and him. [quote=Robo Pilgrim]Greg looks like he's doing a very insouciant high five there. It's as if he just held his arm up for the other guy to hit. [/quote] There is no way of knowing by looking at the picture! 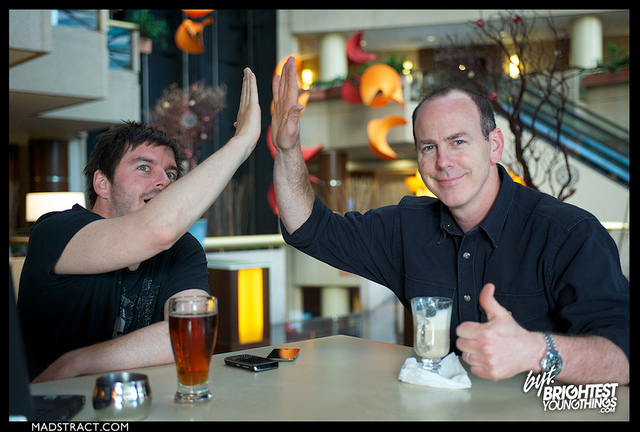 Greg looks like he's doing a very insouciant high five there. It's as if he just held his arm up for the other guy to hit. There is no way of knowing by looking at the picture! [quote=Graffinius][quote=Johnvicious]The DC event will be webcast at [url]http://www.ustream.tv/channel/cspo[/url][/quote]who is recording this? [/quote]Guns or Bossae. [quote=Johnvicious]The DC event will be webcast at [url]http://www.ustream.tv/channel/cspo[/url][/quote]who is recording this? I like how there's too much respect for Greg to make any of the obvious jokes that arise in a sentence involving him and an ancient fossil. [quote=nropevolI]This is depressing. the "more science less music" thing. I'm not interested in 10 books dealing with the same thing. early greg walked away as modern greg took control their minds weren't all the same. to write books was his goal so he built his great library and he slaughtered his own band then he died a confused greg, killed his band with his own mind. go! :D[/quote]frOD3d. Good one! This is depressing. the "more science less music" thing. I'm not interested in 10 books dealing with the same thing. "I believe that playing music can really engage larger audiences’ than lectures." Hell yes . "I believe that playing music can really engage larger audiences’ than lectures." [quote=Ed]Surely Greg is the first musician in history to have had a newly discovered species named after him. That is pretty cool.[/quote]Nope. [url]http://en.wikipedia.org/wiki/List_of_animals_named_after_celebrities[/url][quote=Neil Davis]Do you think you can use your skills to determine if this is a candid photo also? I'm having trouble figuring it out. [/quote]They just set the camera on a mini tripod and used the timer. Surely Greg is the first musician in history to have had a newly discovered species named after him. That is pretty cool. Do you think you can use your skills to determine if this is a candid photo also? I'm having trouble figuring it out. They just set the camera on a mini tripod and used the timer. Surely Greg is the first musician in history to have had a newly discovered species named after him. That is pretty cool. I just hope all this academic stuff doesn't take him away from BR for too long, but I know it feeds his songwriting. I just hope all this academic stuff doesn't take him away from BR for too long, but I know it feeds his songwriting. Good detective work, Robo. Do you think you can use your skills to determine if this is a candid photo also? I'm having trouble figuring it out. Ill be going to the DC thing!!! great article, but the guy needs to practice his high-five positioning. The word recongizintion will be driving me nuts for a few days... Kudos to Jeff for providing a real-life conversational interview. great article, but the guy needs to practice his high-five positioning. Kudos to Jeff for providing a real-life conversational interview.